I spent a lovely few days on a city break in Lisbon, which was a great place to celebrate my wife's birthday. 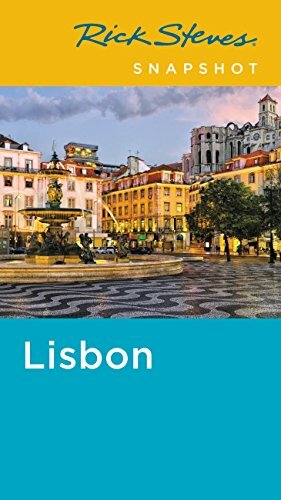 Lisbon is a large city, so it is not easy to see much of it during a three day city break, but you can see the heart of the city and some really pleasant places. Maureen and I had gone to celebrate her birthday, and it proved to be an inspired choice. We stayed in a nice little guest house, whose staff were very friendly and helpful, and whose breakfasts were of good standard. There was a wide range of restaurants for our evening meal. There was some impressive architecture that we were able to view. Over the last three years we have developed family connections with Portugal, as my eldest son, Andrew, married a Portuguese woman and I now have a grandchild with Portuguese nationality. 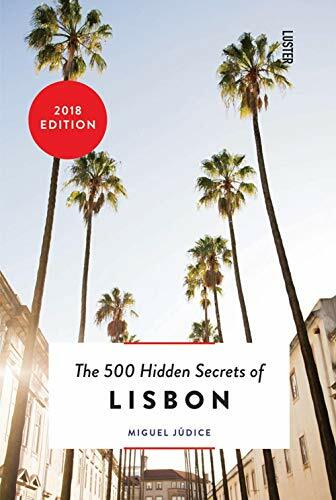 Maureen has been learning Portuguese, while I have a little facility in the language.So when it came time to think of a birthday present for Maureen I decided that a break in Lisbon was ideal. We stayed in a small guesthouse, but small is beautiful. The Ribeira Tejo guesthouse is situated near the Time Out Market, a place with its own thriving and bustling character where people meet for meals at night. We were in walking distance of the beautiful riverside promenade. My experience of this delightful little hotel was such that when we return to Lisbon, as we surely will do, God willing, that we have already decided to stay in the Ribeira Tejo. On the first night we ventured not far to eat. We checked the food hall at the market. If you love large crowded places then you will love the gregarious character of the market, with hundreds of people happily and peacefully dining from food bought in the small stalls lining the sides. However, I don't easily cope with crowds and so we went to a nearby Italian restaurant, where I dined on Venetian risotto, which is risotto with asparagus and Parma ham. Delicious, but we were determined to eat Portuguese on other nights. After supper we had a short walk on the river front and then after I had a beer from the hotel mini-bar we retired to bed. There is plenty of opportunity for night life in the area, as Portugal is a place with a lively life in the evenings, but we are both in our sixties and Maureen has been working extremely hard as a teacher,minding our grandchild and as an executor of her mother's will, so she really does not want to stay up late; and I have no liking for late nights anyway. Views From the River Front. We love old places with character, and Lisbon manages to combine some old, narrow streets with grand architecture. The photograph above shows Maureen at the Praca do Comercial, [Commerce Place] also known as Terreiro do Paco, [ Palace Square. ]It was where the merchants used to meet to do business and the architecture represents the power and grandeur of Portugal in the past. Around the sides are some classy restaurants. We did not dine there as we wanted to eat in more traditional places in the old city. We passed into the old city, which is based on a hill and has many narrow streets and some surprise viewpoints. We did not visit the castle, as we had not enough time, but we wandered around seeing churches. One such church is the monastery of St Vincent. 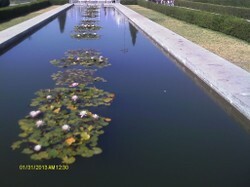 Sadly it was closed that day, but I managed to get a photo of the garden. The garden is a small arboretum with trees that beautiful with pinkish blossom in summer. Much of it is a courtyard, but there is a rectangular pool along one of the walls, whose water cools the air. I far prefer churches to castles, as castles reflect humanity's dark side, whereas churches are ways to the light. Their art and architecture inspires me. We saw the eighteenth century cathedral, which is an impressive building. You can pay to go into the claustra, the cloister, the area which used to be reserved only for monks. The cloister used to surround a monastery garden, but it is currently being excavated as an archaeological site, which has yielded remains dating as far back as the Iron Age, with many remains from ages since then, showing that the site has been continuously occupied for thousands of years. You can also purchase a ticket to the treasury. where the cathedral's special treasures are kept:chalices of gold, richly decorated vestments and books, some handwritten, are preserved. We walked back on the ample promenade and enjoyed the liveliness of it. At points there was music played by small bands and near our hotel there was a small market composed of cafes and stalls. There is a small beach, but one thing that stays in memory is a gentleman who makes sculptures on the shoreline by balancing rocks one on another. They are washed over at high tide, but he remakes them daily. Our Portuguese daughter-in-law told us that we really must visit Belem, a suburb down river from Lisbon, and we were delighted with the place. The bus that took us stops outside the Geronimite [Hieronimite] monastery, which used to belong to the order of St Jerome, a now extinct monastic order whose monastery was given over to the Portuguese state as a site of architectural, cultural and historical importance. The cultural attraction consists of the monastery and the church, the latter of which is free to enter. The former has long queues, especially when a cruise ship comes in. When we were there there were many American tourists in the church, so it seems that a cruise liner from the USA had arrived. The church was an impressive building. Part of the monastery is given over to an archaeological museum, which contains remains from various ages in which the area of Lisbon was inhabited, from the stone onwards. We enjoyed the museum, it was quiet and informative, especially to anyone interested in archaeology. We stopped for a meal in the delightful Restaurante Sagitario, where I had roasted sardines, a Portuguese favourite. We were impressed by the professionalism of the restauranteur, who was dedicated to giving customers the best possible service. But the delight of Belem is its botanic garden,which is really an arboretum, a garden dedicated mainly to trees. There is an impressive collection of palms, tree ferns and cycads, mainly taken from Portugal's overseas territories in earlier days. Cycads are an ancient kind of tree that resembles a palm tree but is older than the palms.In fact the cycads can call the dinosaurs youngsters, as cycads originated a hundred million years before there were dinosaurs. There were also the following type of tree: Chinese metasequioa,coral trees from the South African coast and from South America silk floss trees. The strange spreading shape of the Dragon Tree,a native of Madagascar can also be seen. The grounds are divided into two layers or terraces, the upper terrace revealing remnants of the time when it held the old royal palace. The grounds also contain the official residence of the President of the Portuguese republic, whose opulent residence we were able to view through the locked gates. Our stay was but for a few days, but it was richly packed with sights to see, good food to eat and was a generally pleasant and happy way to spend the run up to my wife's birthday. BSG, Portugal was in Moorish hands for a while then broke free.. The defining event was the arrival of English crusaders in Lisbon in 1147, who expelled the Moors and settled there. Philip the Second of Spain inherited the throne of Portugal, but maintained it as a distinct country, but the Portuguese nobles revolted in the seventeenth century. What a wonderful time you had celebrating with your beautiful wife! Your post made me feel like I was there too! Exactly right, Veronica. It was a short city break, ideal for a birthday week when other activities are happening. We walked a great deal, and remember, Lisbon is a city built on hills, so there is uphill walking to do.To guide ourselves when we walked we always orientated ourselves to the river, for having a guesthouse near the river and an important market made it easy to get back to base. The Botanic garden is very reasonably priced. As a senior I entered for one euro, Maureen at two day short of sixty had to pay two euros. Excellent for what you receive in return. It does sound like a wonderful trip, and you had your DIL to guide you to places that regular tourists would probably miss. I hope you get back there for another holiday! Nice images, and I am certain you had a delightful time. was Portugal once in the hands of the Mores, as was Spain? I know they share the Iberian peninsula, but am not that keen on the histories of the two countries..
Frank what a lovely record of your holiday . I think if it is just a short city-break then the old town and Belem look ideal . Lisbon looks beautiful. And a botanic garden too! Interestingly, Our Dad always had the sardines when he was in Portugal . by Judith Glynn. No other country has such fine hand-painted tiles (azulejos) as Portugal. Whether blue and white or colorful scenes, the art form lives on since the 15th century.